THERE wasn’t an empty bed in Arva during the first fortnight in September. I was in the Cavan town for the King of Clubs during the second week and there was a great buzz that had carried over from Arva’s own sell-out fishing festival the week before. Mind you, it doesn’t take a lot of fishermen to fill one small hotel, a couple of guesthouses and half-a-dozen self-catering houses. But of an evening there was a boost to numbers with lads staying on for a pint and something to eat after the match, and others involved in the festival arriving later from the surrounding villages. There could be a thousand people in town and it would still be possible to find a quiet pub, which is exactly what myself and two friends did. It is the Market Bar, tucked away in the corner of the town square, which has a single bar about 20 feet long run by a very friendly licencee, plus a collection of genial locals. The beer must have been a reasonable price because there were two Yorkshire couples ensconced in the corner. 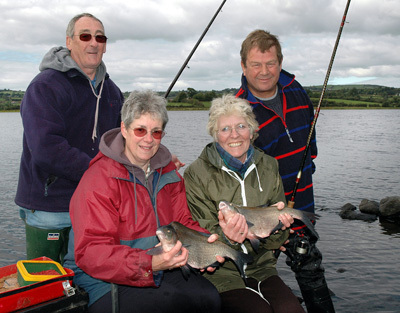 Ray and Pat Smith with Mick and Iris Bowler – from Sheffield – have taken a fishing holiday in Cavan for more than 20 years, the last six in Arva and always nip to the Market Bar, they told me as we started chatting. “We here for 11 nights and that gives us a chance to unwind”, said the ladies. “Fishing is the number one priority and there’s an unbelievable choice of waters located in beautiful countryside where we have the benefit of peace and tranquillity”. What about the angling festival, did it not cause problems with places to fish? “You are joking. Pop along and see us tomorrow morning at Rosduff Shore and see yourself”, Mick suggested. 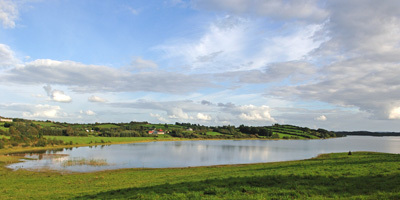 Rosduff is just one the countless shoreline that together form the vast waters of Lough Gowna, which in turn is the first major water on the River Erne system. What a terrific spot they had chosen. I doubt that there was anyone on the far bank (binoculars would be needed to confirm that) and there must have been at least 1000 acres – and the ‘Tykes’ had it all to themselves.And don’t forget; this is free and no fishing licence or day-ticket is needed! Rosduff is sometimes included in the angling festivals but this foursome had sole use of the lake, were able to drive their car right to the swims and on top of that had started catching the first bream as I walked on the bank. Roach and perch were plentiful and Ray netted the first bream on his groundbait feeder gear and three red maggots on a size 16 hook. He was casting about 35 metres into six metres of water and if all four of them stuck to that line, they reckoned that any passing bream would soon find the feed and settle down. Nice fishing if you can get it – and the following on from this session they spent the next three days at Killykeen, which is equally big and part of the Lough Oughter complex, catching roach to 1lb on seven metre poles to hand and going through three pints of casters each for estimated catch, again about 20 kilos. While my new friends were swanning around Cavan in holiday mode, Ian Fieldhouse was pocketing £3000 for winning the ‘King of Clubs’ after five days of intensive match fishing and representing a new generation of anglers who are discovering Ireland. The 38 year old AA patrolman had been in town for two weeks and won cash on 11 consecutive days, which meant he had to stuff a total of £5000 into his suitcase for the drive home to Ilkley. During the week Ian had tackled Dernaferst, Gulladoo, Brackley, Bunerky and Glasshouse lakes, where roach had been the dominant factor with an increasing number of decent size skimmer bream. He used a crumb feeder on the first two days for a net of roach, hybrids, skimmers and perch, on red maggot; on Wednesday had to fish half-and-half with the feeder and pole, then finished off the last two days just pole fishing. 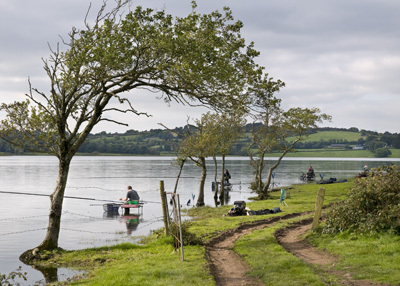 ARVA has the versatility of fishing and accommodation to suit everyone. The town is surrounded by waters, the nearest are five minutes by car, access is excellent, there are plenty of pubs and places to eat and you will be most welcome.